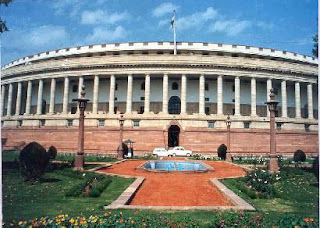 In my view loksabha or assembly is called to discuss problems of the different constituencies in the presence of the ministers.Legislatures are elected from different parties for different constituencies.So opposition party members wont have proper communication with the ministers and chief minister.So, In order to bridge gap this difference between the various levels of the administration,A assembly or parliament is called. Dump I say dump..They discuss nothing...They dont even know whats the problems of the people.They know the major problems through the news papers.The oppopsition takes one issue which may be the weak link of govt and the govt does the same.They fight with each other all the time when the assembly or lok sabha goes on and never end up discussing with prblesm of people.Insted they discuss problems like corrupt of minister,some minister scam,some one income is higher and all personal issues.They even do some street fighting inside.Half of the house time is spent in adjourning it and postponing it.After all sometimes when they discuss some issue,They come up with solution that increases their vote bank, not doing something good to people like reservations for oBc !!! The most stupid thing they say in the end is that they cant discuss each and every issue due to lack of time.The thing that looks weird is when they want to discuss issues,Cant they extend the time of the house for some more time?? ?whats more for them other than discussing the issues of the public??? making sketches on how to earn some bugs when their govt is in power ???? or thinking how to trap govt so that the opp can be govt next time?? ?